Menthol chewing gums, not so cool after all! What is your reason to chew gum? Is it to lose weight, beat bad breath, to overcome your sweet craving or just chew on it when you are sitting idle?? I have seen people who never get bored of chewing gums! If you are one of those, then you'll be surprised to know these facts. Did you know that chewing gum can increase your food craving? The chemical ‘menthol' which gives the minty flavor to chewing gums plays a vital role in changing eating behaviors. Some studies have found it to increase cravings for salty chips, sugary drinks and candies. According to a new study, the minty fresh flavor makes fruits and vegetables taste bitter, further reducing your appetite for "healthy food". Nutrition studies from Ohio State University also suggest that it is the same chemical change which makes your orange juice taste bitter immediately after you brush your teeth. There are also conflicting results on chewing gums supporting weight loss, because they increase craving for junk food! Researchers suggest that menthol in the mint interferes with nutrients in fruits and vegetables, manipulate flavors, and create a bitter taste and turn you off from healthy food! So beware! 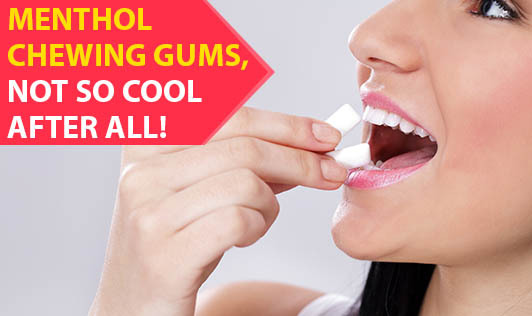 Chewing gums have the potential to divert you from a healthy food routine!